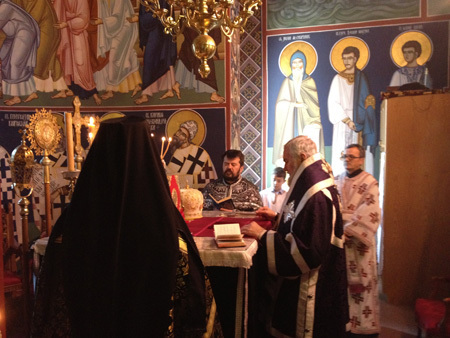 Milton, Ontario - On Wednesday of the fifth week of Great Lent when our Church celebrates the memory of the Holy Martyrs Agapius, Publius and others with them, His Grace Bishop Georgije of Canada served the Holy Hierarchical Liturgy of the Presanctified Gifts at the monastery church in Milton, with the con-celebration of V. Rev. 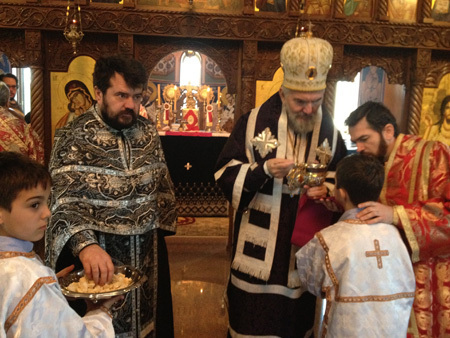 Milojko Dimitric, of London, ON, Sindjel Vasilije, abbot of the monastery and deacons: Stefan Ikonomovsky and Damjan Radojcic. The clergy came together for the confession of clergy for the eastern Canadian deaneries. Confession took place prior to the liturgy. V. Rev. 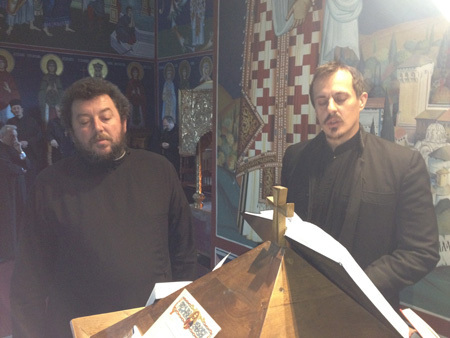 Stavrophor Mihajlo Doder and V. Rev. 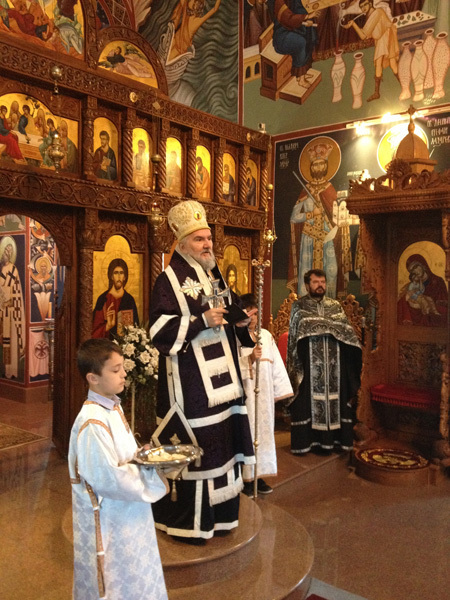 Stavrophor Vasilije Tomic served as father confessors. 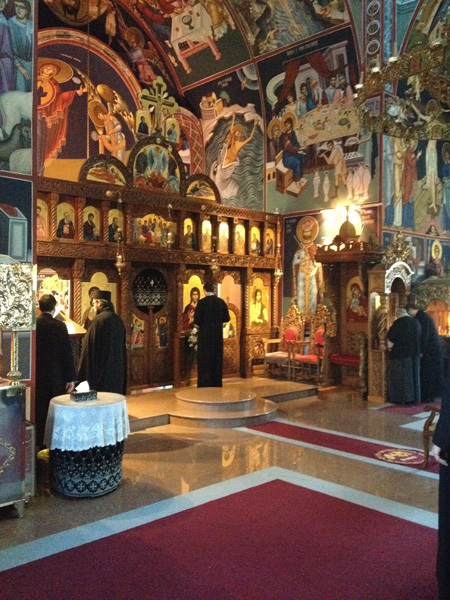 Following the Divine Liturgy a meeting was held in the monastery hall with the bishop during which they spoke of the upcoming visit of His Holiness Patriarch Irinej of Serbia to the Canadian Diocese. 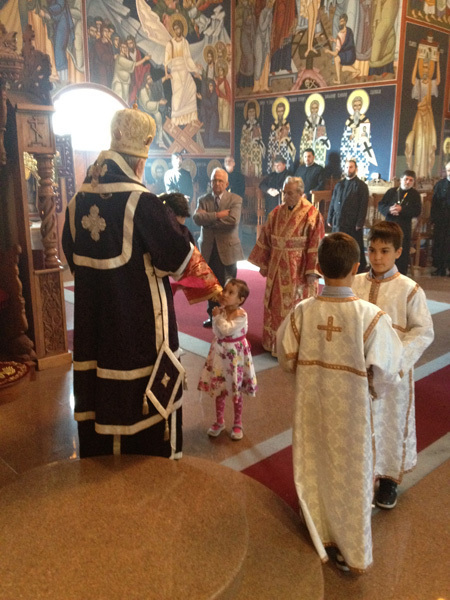 At that time Bishop Georgije gave to each clergyman a new set of vestments which would be used during the canonical visit of His Holiness, but also at all future diocesan gatherings and feasts, that they be celebrated with more solemnity and beauty. A lenten monastic meal followed after which the clergy received His Grace's blessing and bid farewell.